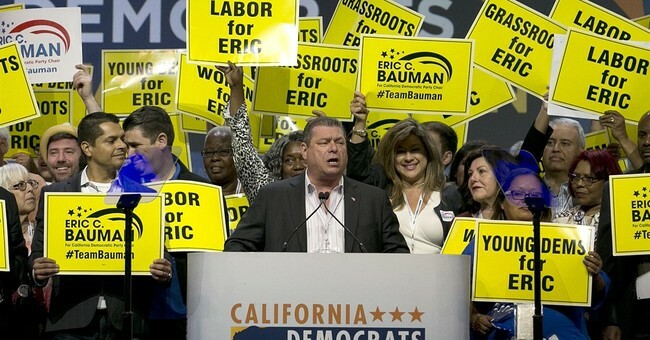 The Los Angeles Times reports that "three former and current employees" have sued the California Democratic Party and its former chairman, Eric Bauman, for what they claim constituted "a culture of harassment and sexual misconduct" within the party and that California Democratic officials were well aware this discrimination was occurring. The complaint, filed in Los Angeles County Superior Court, alleges a workplace where drinking during the workday and inappropriate comments went largely unchallenged, and claims that some party leaders retaliated against those who reported allegations of harassment. The plaintiffs are seeking payment for lost wages in addition to punitive damages. The lawsuit comes amid continued upheaval in the state party after the resignation of Bauman, who stepped down following claims of sexual misconduct and inappropriate behavior toward party staff members and activists, and said he planned to seek treatment for health issues and alcohol use. It details allegations against Bauman first reported by The Times in November, and includes new accusations of harassment against him and others. Bauman's lawyers denied to comment on the ongoing story, but his accusers detail alleged unwanted touching, personal questioning, and salacious comments during the 2018 campaign season. The three staff members who filed the suit were hired in the weeks leading up to the November midterm elections: Kate Earley, 21, who has worked as the party’s digital director since September, and Will Rodriguez-Kennedy, 31, and Alton Wang, 24, who were hired that month to help run a voter outreach effort. Wang was let go in December; Earley and Rodriguez-Kennedy are still employed by the party. The lawsuit claims Wang was terminated in retaliation for his complaints of harassment. Earley alleges that Bauman "asked Earley and another female staffer, Grace Leekley, in front of other staffers whether the two were having an affair" during a party bus replete with insurance coverage that allowed for the consumption of alcohol as Democratic party staffers toured the state stopping at various campaign rallies. Earley says that Bauman began heavily drinking a 9:30 am on the bus. Likewise, the lawsuit also says that another party official, Dan Weitzman, also made comments about Leekley's physical appearance to Earley. Weitzman says he does not remember saying such comments and apologizes for them if he did. Speaker of the House Nancy Pelosi's daughter, Christine Pelosi, heard about the behavior on the party bus and disinvited the group from attending her mother's rally. Pelosi told the Times that the San Francisco Democratic Party hosted the rally instead of the state party and that she spoke to Earley and Leekley in an attempt to 'navigate an informal solution.'" A spokesperson for California Democratic Governor Gavin Newsom's camp emphasized he called for the resignation of Bauman as soon as he heard of the allegations. Current state party officials refused to comment on the allegations but stressed they were "strongly supportive" of their staff.